Tokyo Gameshow is in full swing! You thought we were only going to hear about Final Fantasy XV huh? Nope! They granted us with the first trailer showing off the remastered content for Final Fantasy XII: The Zodiac Age. 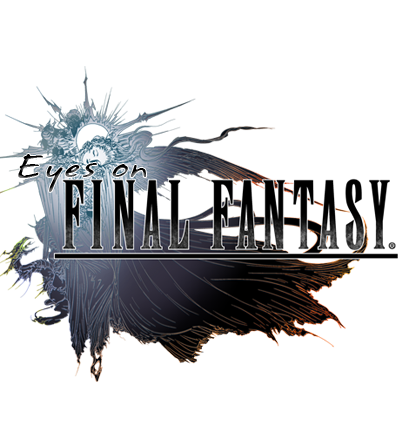 It was announced that the featured exclusive Final Fantasy XV Playstaion 4 will be coming to North America and Europe! We've got the details for you thanks to Siliconera! The Luna Edition PS4 model will come with a Limited Deluxe Edition Bundle, featuring the new slimmer, lighter PS4 model with a 1TB HDD, and a large illustration on the front of the system. Also included in the bundle is a copy of Final Fantasy XV with the exclusive Steelbook case, a DualShock 4 controller with a Final Fantasy XV graphic, and a Kingsglaive: Final Fantasy XV Blu-ray. It’ll also include several DLC pieces, with the Royal Raiment Outfit, Masamune Weapon, and Leviathan Regalia Skin. This baby will be an exclusive for Gamestop and EBGames. The Luna Edition Limited Deluxe PS4 Bundle will be $449 USD/$549 CAD. Europe will also get a standard edition bundle, which features the standard PlayStation 4 Slim model with a 1TB HDD, and Final Fantasy XV. Both will be available on the release day, November 29th, 2016! Tokyo Game Show just had a brand sparkly new Final Fantasy XV trailer for us! We know you are all excited about the release but since it has been moved back a bit, they have granted us with this lovely piece of work. Check it out! Tokyo Game Show 2016 starts on September 15 and today, Square Enix has granted us with their lineup. Square's lineup features some goodies, but games noticeably absent here are Kingdom Hearts III, Dragon Quest XI, and the Final Fantasy VII remake. Final Fantasy XV, NieR: Automata, and World of Final Fantasy are the ones to watch out for here. For those lamenting over the absent games, Kingdom Hearts III is scheduled to have new information released this winter and Nomura stated that more information for Final Fantasy VII once World of Final Fantasy and Kingdom Hearts 2.8 drop. As for Dragon Quest XI, well I can't help you there. Tokyo Game Show 2016's venue will be at the Makuhari Messe in Tokyo, Japan. For the full list of games to appear check the list below. On the most recent Dissidia stream, Square Enix revealed a new title for the Final Fantasy series, Dissidia Final Fantasy: Opera Omnia. This title is a spinoff of a spinoff, departuring from the fighting game aspect of the Dissidia Final Fantasy series with turn-based RPG action. The UI and battle animations are in the style of the Dissidia fighting games, making them just a bit too garish and flashy for me. The game includes characters never before seen in the Dissidia series like XIII's Sazh,VIII's Seifer, Fujin, and Raijin, and Type-0's Rem Tokimiya. Dissidia Final Fantasy: Opera Omnia will be coming to iOS and Android sometime this year in Japan only. You can check out the reveal trailer below and the game's website here. Meet the FFXV English Voice Cast! Today, Final Fantasy XV's official Youtube channel released a video showcasing the voice actors of some of the main characters of the game. After much speculation, the official voices have finally been revealed (with Kari Wahlgren, the voice of Ashe from FFXII returning as Aranea Highwind, though she isn't featured in the video). Each of the actors soeajs about what makes their characters compelling to work with, and what the overall impression that Final Fantasy XV made on them was. Click on the video below to check them out for yourself! So Final Fantasy XV has been delayed. Again. With a tangible release date this time, thankfully! 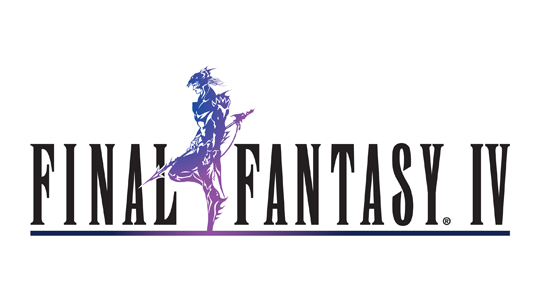 Tune in to the latest episode of Final Fantasy Talks where Psychotic and I discuss our thoughts on this recent pushback! 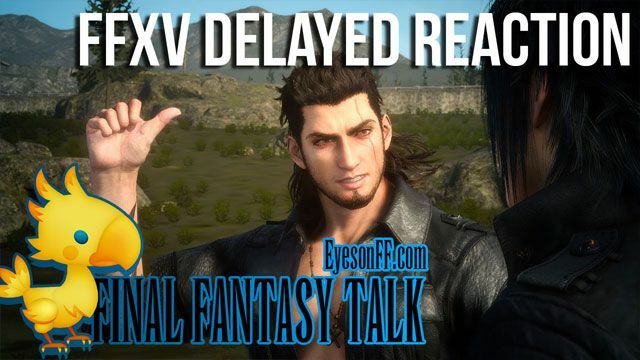 The recent announcement of Final Fantasy XV's two-month delay was met with a mixed reception. Many people are glad that we will be getting a more polished product, but others have become so fed up with waiting that their hope for the product has started waning again. Apparently, some have even turned to the competition for comfort! 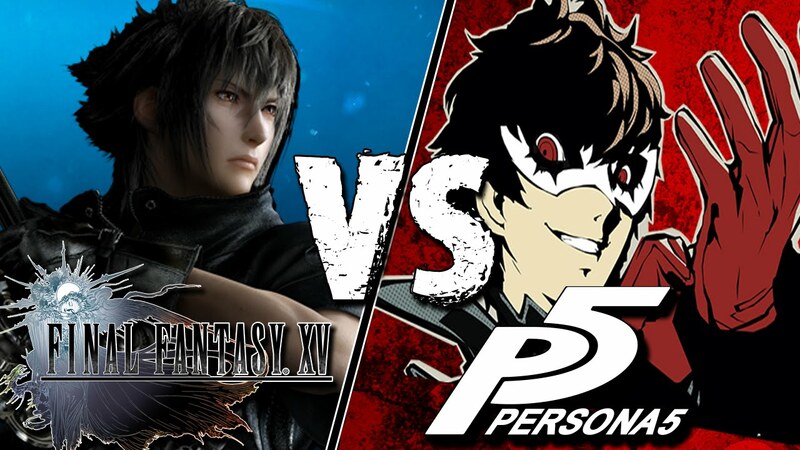 A while ago Square Enix provided their users with a poll, asking whether they were more interested in Persona 5 or Final Fantasy XV. The reasons were speculated to be either the similar release period (with Persona 5 having a Japanese release planned just two weeks before Final Fantasy XV) or the Persona series' increased prominence in recent years, especially among JRPG enthusiasts who have long been Final Fantasy's core user base, some of whom have begun to felt more and more alienated by the real-time action RPG combat and more of a move to science fiction than fantasy. Square Enix released new renders of various characters from the upcoming Final Fantasy XV game (due out November 29 world-wide on the Playstation 4 and XBox One). Here we see the dudes, Noctis, Ignis, Gladiolus, and Prompto. We also get a good look at King Regis, Noctis' father, with another older gentleman rumored to be an aged Noctis. For the first time we see full renders of Luna and Gentiana. There's also the Niflheim's Chancellor Ardys, plus we finally get to clearly see the face of Aranea Highwind without her helmet. Announced earlier today on IGN's Gamescon stream, Nier: Automata is coming to PC via Steam. While published by Square Enix this action oriented title is being developed by Platinum Games, makers of Bayonetta and Metal Gear Rising: Revengeance. The team also consists of producer Yosuke Saito (DRAGON QUEST® X / NIER), director YOKO TARO (Drakengard® / NIER ), character designer Akihiko Yoshida from CyDesignation, Inc. (FINAL FANTASY® XIV / BRAVELY DEFAULT®), game designer Takahisa Taura from PlatinumGames Inc. (Metal Gear Rising: Revengeance), and composer Keiichi Okabe from MONACA, Inc. (TEKKEN / Drakengard 3 / NIER ). 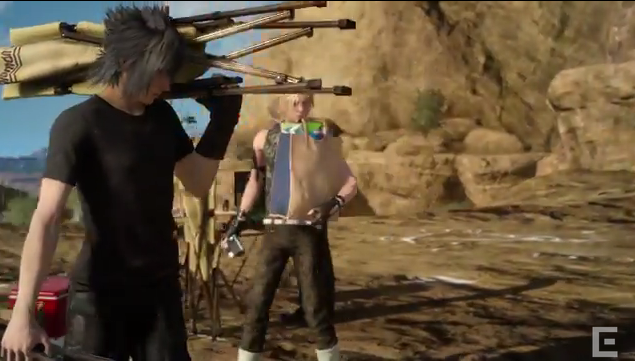 Final Fantasy XV showed us some footage of the mastered version of Final Fantasy XV. While the game has been delayed, this should help give us some ideas about what to expect in the final product.